A new gadget could spell an end to books as we know them. Researchers at Hewlett Packard have developed a prototype electronic book which can hold a whole library on a device no bigger than a paperback. The brushed metal device is about one centimetre thick and looks like an oversized handheld computer. The technological tome is dominated by a screen and a series of touch sensitive strips that allow the reader to navigate through the book. E-books are loaded on to the device using a standard USB port on a computer. The developers were keen to retain features of traditional books that people like while trying to dust off their out of date image. "We've been looking at the power of the book as a way of consuming information" said Hewlett Packard's Huw Robson. "We've been using them for so long that we're very comfortable with the idea of paging through something". 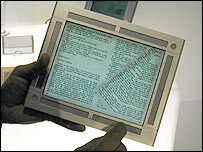 To keep page turners happy, Mr Robson and his team have fitted the e-book with a small but powerful computer that animates a turning page when the reader is ready to move on. The pages are turned by running a finger along one of the strips. Stroking the strip at different speeds allows the reader to speed read or casually browse the book. 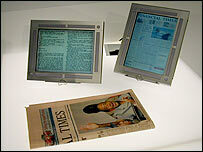 The display can also be used to read broadsheet newspapers. The reader scans the page for something of interest and then uses the touch pads to zoom in on the story. Particular pages can also be assigned a bookmark or an electronic finger allows you to flick between two chapters immediately. The market for electronic books is still to take off. The main problem with them is that the screens - like computer displays - cause eye strain. However new advances in electronic paper displays may get around this problem while making the prototype device slimmer and more powerful. 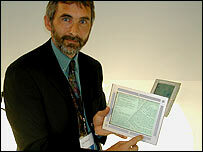 "Radical new display technologies are on the horizon which will give a much more paper like feel", said Mr Robson. "When this comes along we need to have researched all aspects of how we will develop new displays so that we're ready to rock and roll."